Anthrax is a serious, usually fatal disease caused by the bacterium Bacillus anthracis. It occurs world-wide and can infect a wide range of domestic and wild animal species as well as humans. In grazing livestock, anthrax usually presents as the sudden death of one, or a group of animals in a mob. Anthrax can kill stock of any age or class with no warning and can result in significant losses. Anthrax is listed as prohibited matter under the Biosecurity Act because of the potential danger it poses to people, other livestock and the possible impact on Australia’s export markets. It is a notifiable disease in NSW, and anyone who suspects anthrax must report it immediately. Hot and dry conditions favour the development of anthrax. With drought now covering much of NSW, the conditions for infection are ideal and may result in more anthrax incidents than would normally occur. Anthrax can be prevented by annual vaccination of cattle and sheep. Producers are encouraged to consider vaccinating animals if they are grazing in high risk locations (Figure 1). What are the risk factors for anthrax? Moderate rainfall following prolonged dry periods. The presence of alkaline soils which favour spore survival. A history of anthrax on the property. How can anthrax be prevented? Anthrax vaccine is used to protect livestock from infection in NSW. Annual vaccination of cattle and sheep on properties with a history of anthrax is strongly recommended. Vaccination provides effective protection against anthrax when the manufacturer’s directions are followed. You must apply to use the vaccine by submitting a form to your Local Land Services district veterinarian. Once authorised, you can then place an order for the vaccine with your local rural supplier or private veterinarian. For more information, contact Local Land Services on 1300 795 299. How can I spot the signs of anthrax? blood from the carcase does not clot. What should I do if I suspect anthrax? Immediately contact Local Land Services on 1300 795 299 or call the Emergency Animal Disease Hotline on 1800 675 888.
keep the affected mob separate to all other animals on the farm. A veterinarian or an authorised officer under the Biosecurity Act will investigate suspect cases of anthrax. If suitable samples can be collected, they can be tested on-farm. If samples are not available, smears of blood and a piece of the animal’s ear will be collected for examination at the laboratory. If you have any concerns for your own health or those on your property, please see your GP or call 1300 066 055 to be directed to your local Public Health Unit. Does anthrax occur in NSW? Cases of anthrax in NSW tend to occur in an area which runs through the centre of the state and into Victoria. 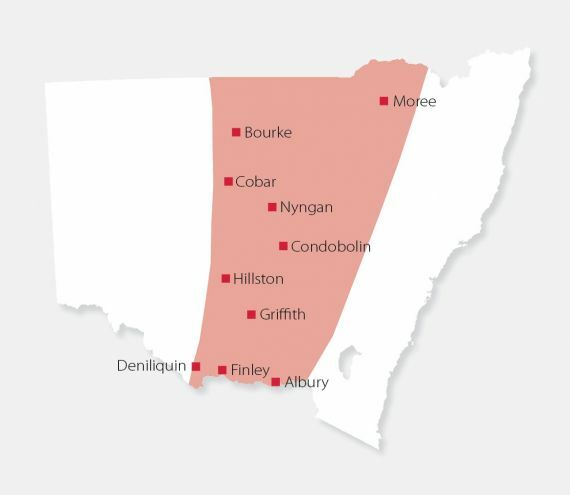 The area lies approximately between Bourke and Moree in the north, to Albury and Deniliquin in the south. Although anthrax does not occur frequently in NSW, its re-appearance is unpredictable. Anthrax can survive for long periods in the environment by forming tough spores which can lie dormant in the soil for decades. You need to remain alert to the disease and report any suspicious livestock deaths immediately by calling the Emergency Animal Disease Hotline on 1800 675 888. Figure 1. For the last 50 years almost all cases of anthrax in NSW have occurred within the highlighted region. For more information, contact Local Land Services on 1300 795 299, visit NSW DPI or call the Emergency Animal Disease Hotline on 1800 675 888.